Croatia is one of the most popular tourist destinations since the end of the last century. Today real estate in Croatia attracts not only lovers of a perfect holiday on the Adriatic coast, but investors seeking profitable tools for long-term and highly profitable investments. After all, Croatia - a member country of the European Union, which has a rather high standard of living and well-developed and stable economy. Real estate in Croatia - by the sea or in the mountains? In Croatia, despite the relatively small area, have several types of climate. 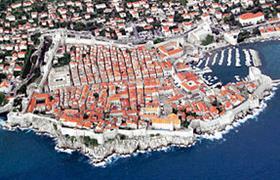 In northern Croatia prevails continental climate, in the central - alpine, and on the coast - Mediterranean climate. This allows each property buyer in Croatia to choose the most suitable place or the region for his future home. And if the house is not located on the sea but in the mountains, the vacation of its owners will not become less enjoyable - in fact they can always easily reach the coast or the mineral springs by car, bus or ferry! Among the advantages of Croatia cannot fail to highlight the fact that in this country there are more than one hundred beaches and almost twenty marinas, which are carriers of the prestigious international award Blue Flag for favorable environment and water quality. The owners of houses on the coast of Croatia can spend their annual vacation at any time of the year and stay in the country as much as they like. After all, they no longer need to depend on the season or tour operators. At the same time, you can rest in Croatia, both in summer and winter - opportunities for homeowners here for a variety of pastime are a lot in any region. It is possible to buy a house in Croatia from the owner and the builder. The choice of high-quality residential and commercial buildings in this country is very diverse from the well-known resorts to the large cities and small towns. But the holiday homes in Croatia or real estate in the capital - this is not just a house, it is also a long-term investment, which is able to protect the capital against inflation. Besides, foreign owners may, if necessary, or if they wish to let the property for rent and get a stable extra income.